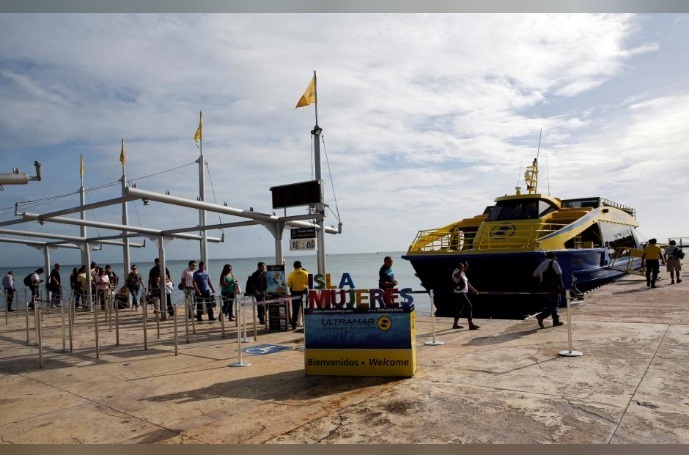 People are about to board a tourist boat with route to Isla Mujeres, after Tropical Storm Nate in Cancun, Mexico October 7, 2017. HOUSTON - Major shipping ports across the central U.S. Gulf Coast were closed to inbound and outbound traffic on Saturday as Hurricane Nate intensified and storm surges of up to 11 feet (3.74 meters) were expected. The U.S. Coast Guard on Saturday ordered port condition Zulu, a halt to all traffic, beginning at 8 a.m. local time for New Orleans; Gulfport and Pascagoula, Mississippi; Mobile, Alabama; and Pensacola and Panama City, Florida. New Orleans, which sits near the mouth of the Mississippi River, is an important transit point for energy, metals and agricultural commodities moving to overseas and domestic markets. Nate is expected to strike the U.S. coast on Saturday night as a Category 2 storm on the Saffir-Simpson Hurricane Wind Scale, the National Hurricane Center said on Saturday. At that intensity, it would have destructive winds of 96 to 110 miles (154 to 177 km) per hour. Restrictions on New Orleans inbound and outbound traffic span the lower Mississippi River from the Huey P. Long Bridge above Head of Passes to the Southwest Pass entrance at mile marker 20 below the head of passes, the Coast Guard said. Gary LaGrange, executive director of trade group Ports Association of Louisiana, said he expected traffic restrictions to be lifted quickly once the fast-moving storm passes overnight. “It’ll be short-lived based on the projected path and movement of the storm unless an unlikely event happens - such as two vessels colliding,” he said. Vessels were still moving to secure berths at the ports on Saturday morning, he said. The storm already has caused oil companies to evacuate workers at 66 production platforms and five rigs in the U.S. Gulf of Mexico, according to the U.S. government. As of Friday, operators had shut output equal to 1.24 million barrels per day of oil and 1.7 billion cubic feet per day of natural gas production in the U.S. Gulf of Mexico due the storm, it said. Phillips 66 also halted operations at its Alliance, Louisiana, oil refinery on Saturday. The refinery is south of New Orleans along the banks of the Mississippi River. Major shipping ports across the central U.S. Gulf Coast were closed to inbound and outbound traffic on Saturday as Hurricane Nate intensified and storm surges of up to 11 feet (3.74 meters) were expected.